Do you talk with your hands? Many people do. In fact, some researchers claim that up to 70% of human communication is accomplished through body language. Hand signals are a common type of nonverbal communication. But be careful when you’re travelling or addressing someone from another culture. Hand signals aren’t universal, and you might be saying something unintended or even offensive with yours. For example, here are six common hand signals with different meanings around the world along with their different meanings. You’re more than likely familiar with the “V for Victory” sign, or the peace sign for those of you still stuck in the 60s. This sign has a number of different possible meanings, depending on where you are and the direction your palm is facing. When your palm faces out, towards the person you’re addressing, this sign usually means “victory,” “peace” or the number two. In the United States, this version is much more innocuous. It’s how you sign the number 2 and the letter V in American Sign Language. As a result, it’s not uncommon for Americans to get mixed up. For example, in 1992, US President George H. W. Bush (in)famously “gave the forks” to a group of protesting Australian farmers. Apparently, he intended to flash the peace sign at them. In Japan, China and Korea, people commonly flash the V-sign when they pose for happy photos, often instead of smiling. In some countries, the thumbs-up gesture is a sign of approval. However, in Australia, you’re inviting onlookers to “sit on it.” They are unlikely to respond kindly to that invitation. It’s also an insult in Bangladesh and in parts of the Middle East. When crossing your fingers does not bring good luck. Crossing your fingers is said to bring good luck (or at least to protect against bad luck caused by lying.) Unless, of course, you’re in Vietnam, where it’s the gestural equivalent of calling someone a See You Next Tuesday. Come here . . . and put on these handcuffs. Beckoning a person to “come here” with your fingers is cause for arrest in the Philippines, where the hand signal is only used to call dogs. If you’re at a hard rock or heavy metal concert and you want to indicate your appreciation for the music, what do you do? Make the sign of the horns, of course! While rock musicians have been spotted making the sign of the horns since 1969 or so, you can thank Ronnie James Dio for its association with heavy metal. Unless you’re Gene Simmons, who actually tried to trademark the hand gesture in 2017. That is so not metal – especially since the sign of the horns has been used in various cultures for centuries. For example, Dio claimed he learned the sign from his Italian grandmother, who used it to ward off the Evil Eye. That’s still a common use of it today, in Italy and in other Mediterranean cultures. One important point, however – to ward off bad luck, you have to make the sign with your fingers pointing down. If you make it with your fingers pointing up and facing towards someone, it’s an insult that means “your spouse is cheating you.” To be safe, save the metal horns for metal concerts if you’re travelling to another country. A-Okay? Not in these countries! In Greece, Spain, Brazil, and several other South American countries, however, this gesture is both insulting and obscene- you’re calling the person it’s directed toward an a**hole. Meanwhile, in Turkey, the gesture translates to a slur against LGTBQ+ people. For international travellers, this seemingly innocuous gesture is probably best left at home. 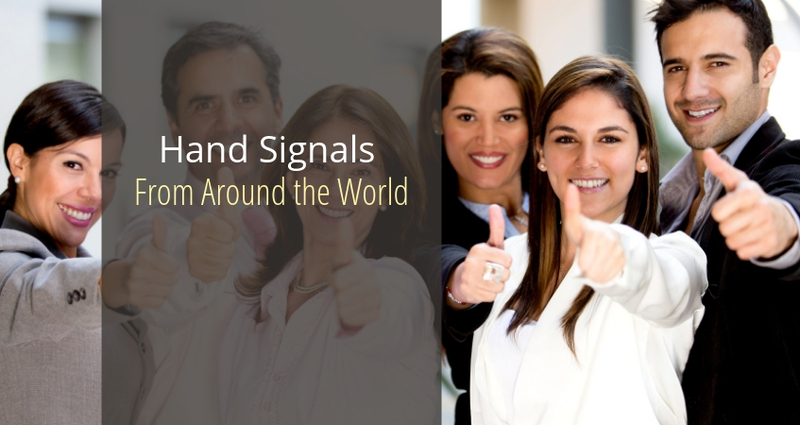 For businesses with international ambitions, it’s important to be aware of the different possible meanings of the hand signals and gestures that appear in both marketing and internal communications. You don’t want your advertisements or even your logo to unintentionally offend potential customers, partners and employees. At K International, we can help. Our team of experienced linguists, skilled international copywriters and designers are on hand to translate your marketing and adjust visual elements (like hand gestures) as needed. If needed, we can also redesign a campaign from scratch to better appeal to your target market. If that sounds good to you, contact us for your next translation project!